The Service Reviews page allows you to manage your business's reviews, contact and engage with reviewers, and share your reviews on social media. Go be seen! If no one's reviewed your business yet, your service reviews page displays information about how to start inviting your customers. You'll also see what reviews will look like once you start getting them. Choose a filter, then click the Apply button. You can apply multiple filters at the same time. You can also use the search field to look for specific reviews. Automatic invitation An invitation that was automatically sent by an integration between your systems and Trustpilot. This includes AFS, our eCommerce plugins, and API-triggered invitations. Manual invitation An invitation sent using one of our manual invitation methods. Organic A review that a customer wrote without an invitation. Generated link An API-generated link, Unique link, or Business Generated Links that you've sent to the customer from your own email system. Basic invitation A review from a reviewer who click on a generic link to your company's evaluation form on Trustpilot. Embedded review form A review that comes from the review form that's embedded on your website. Want to find out more about who left a review? Or contact someone about a review they left? Find certain types of information about reviewers on the Service Reviews page. Reviewer information: Point to the reviewer’s name to see their user name, email address, number of reviews, and location. It also includes a link to their user profile. The reviewer's email address won't appear if the review is organic. Reference number: The reference number identifies your customers and their transaction. Our system adds the reference number automatically if it's supplied with the invitation. There might not be a reference number if the reviewer gave you an organic review. Now that you've collected lots of great reviews, it's time to start managing them. Respond to feedback, share reviews, organize them with tags, and, if there are any issues, report them to our Compliance team. Reply: It's a great idea to respond to your reviews. It demonstrates that you're committed to your customers, and shows that you value all feedback - positive and negative. Providing a thoughtful, constructive response to a negative review can turn a negative customer experience into a positive one. Select the Reply button. Write your response, and then select the Publish button. The reviewer will receive a notification that you've responded, and your response will be visible under the review. Share: Be seen. Share your reviews on Facebook, Twitter, Google+ and LinkedIn. Find Reviewer: If you receive a review from a reviewer that you don't recognize, use the Find reviewer feature to contact the reviewer directly. Select the Find reviewer button and follow the instructions in the dialog. Report: If you believe that a review contravenes our Guidelines, you can report the review to our Compliance team. Select the Report button, then select Continue. In the new dialog, select the reasons for reporting the review. Tag: Add a tag to reviews to make sure they're included in a TrustBox or other applications. This helps your best reviews reach a wider audience. Select the Add tag button. In the text box, enter the tag name. Export reviews: Use Export reviews to save a local copy of your reviews. Click the Export tab. 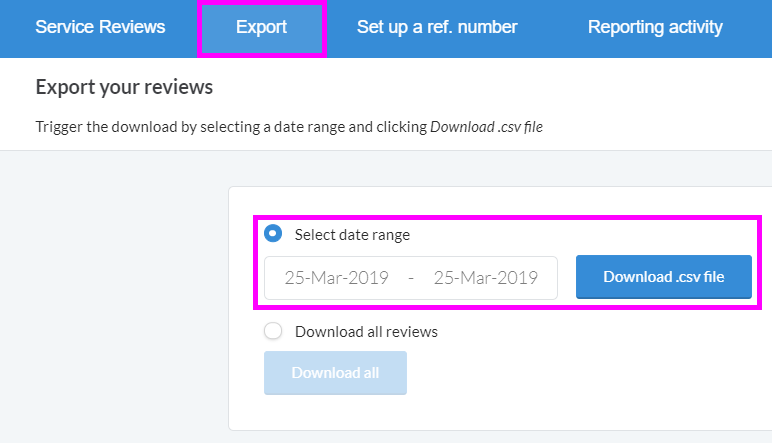 On the Export your reviews page, select a date range, then click the Download .csv file button. If you stay on the page while the file is being generated, it will download automatically once it's ready.